It sometimes seems that every regime needs to find its justification in science. Ideology is fine, to a point. But the final arbiter of legitimacy resides, or so it seems, in science. So what of science? The Soviet Union had its ideological foundation in dialectical materialism—that edgy methodology that combines, you guessed it, dialectics and materialism. In essence, so the theory goes, matter moves from one state to another in an endless ascendancy from the lower to higher. I know, blah, blah, blah. Just a load of muddled nonsense. But it was the Soviet religion. And everything had to be justified through it. Mendelian genetics in favor of the hybridization theories of Russian horticulturist Ivan Vladimirovich Michurin, and adopted them into a powerful political-scientific movement termed Lysenkoism. subsequently became famous for the discovery of “vernalisation,” an agricultural technique that allowed winter crops to be obtained from summer planting by soaking and chilling the germinated seed for a determinate period of time. More muddled nonsense. But since Lysenko and his nonsense—er, theories—fit the nonsense that is dialectical materialism, he became a sweetheart of the state bureaucracy. And as Lysenkoism grew in power and prestige, so did the pressure on those who dared object. Alternate theories were rejected and proponents forced from positions and jailed, and sometimes even sentenced to death. Mendelian genetics was pushed from the halls of academia into the hushed-hushed backrooms where no one listened, except spies for the state. There were two other results of Lysenkoism worth noting: food shortages and waste. But, hey, what’s a few cracked eggs among friends, especially when the omelet is for the state? The key to my opening statement is not that science needs to justify the state. The key is that the state needs to find the science that will justify its (the state’s) existence. Long live the Party of Lenin and Stalin, which discovered Michurin for the world and created all the conditions for the progress of advanced materialist biology in our country. Glory to the great friend and protagonist of science, our leader and teacher, Comrade Stalin! Does any of this sound familiar? In the 1930s, the state adopted Keynesian economics. It did not do so because the system made sense. No, the state adopted Keynesian economics because it justified the state and the state’s profligate ways. Keynes was the Lysenko of the Roosevelt administration. The state declared Keynes a genius and worked to control his opposition. No Siberian Gulags, just academic ones. But the chilling result was the same here as in the Soviet Union. The state’s science became the science, and science and state lived happily ever after. For a while anyway. When Stalin died, Lysenko was first discredited by Khrushchev. Nevertheless, Lysenko was to find favour again, and at that with Khrushchev, for his researches into composting and breeding dairy cows with high butter fat, themes both dear to Khrushchev who wanted to raise the USSR’s milk output. In the end, the Soviets finally recognized that Lysenko was a fraud, though it took a half a century. Here in the United States, it took us almost the same amount of time to begin to question Keynesianism. And just like Lysenkoism, Keynesianism fell out of favor only to subsequently return to favor once again—nothing like more butter fat to whet the appetite of the political class. Of course, Keynes is gone—his long run ended years ago. But Keynesianism lives on through its adherents. And Paul Krugman is the most visible one we have today. But Krugman is just another Lysenko—peddling nonsense that justifies the state. As one of its most prominent and vocal proponents, Krugman is an influential activist for the political class and the status quo. So, of course, he is blessed by the state. Most importantly, Krugman is willing to see more than a few eggs cracked in order to serve up a state-sized omelet—I think he calls his special omelet the Laureate, but I am not certain of that. Every state needs justification. And the justifiers are always welcomed and cheered by the state. So we should not be shocked that a false science—a science that props up the state—is embraced by the state and associated sycophants. But we must always remember that in the end, the nonsense is revealed for all to see, with the proponent receiving his due discredit. But how long do we have to wait? And what will be the final result? Only time will tell. Little argument with your main point, but vernalization is hardly “muddled nonsense.” It’s a well-understood and valid technique for controlling seed dormancy requirements and the biochemical changes prior to germination. By doing it you can get seeds to sprout in greenhouses long before spring planting time outdoors. It appealed to Lysenko probably because the environment was manipulated rather than the genetic characteristics. Bottom line: be careful which examples you use to support your thesis; they might actually undercut it. Good call out. I should have been clearer in that I was referring to Lysenko’s use of the term vernalization, not how it is used today. What you described had been long known by scientists — it was not a Lysenko discovery, per se. The inheritance of vernalization by offspring was indeed a Lysenko “discovery” that fit with Stalin’s political views. As for former Enron advisor, Paul Krugman, you are spot on. That’s not “science” at all. Addressing the issue as one of “science” (or “scientism”) is itself abusing the language & constitutes misrepresenting things for what they aren’t. Flip a dime & quarter 20x’s — heads 10x’s & 15x’s respectively. Thus, if one wants tails, flip a penny; heads, flip a quarter. If one wanted more prosperous crops, apply Lysenko’s techniques. Of course the coin flip conclusions are nonsense, but in a study where such flaws are not readily apparent (and other factors such as anecdotal feedback are accepted & applicability of other factors are over-extended) such a flawed conclusion is easily reached–and might go unrecognized as such for quite some time. In Lysenko’s case, once a psychotic & highly insecure & powerful leadership accepted the premise (or pushed it too far), there was no way they’d admit they’d made a mistake. Certainly not Lysenko, with all the perks & prestige foisted on him (not to mention certain execution if he said anything to make the leadership feel they were made to look flawed)…thus, the incentives to persist in a wrong-headed policy were just too strong. Ideological powers will, sometimes, invent myths to suit their interests and that may include concocting supporting “science” (but its not really “science” its lies & propaganda). Sometimes they just blunder into something and can’t bring themselves to admit they’d made a mistake. Lysenko’s approach seems to have had elements of both contributing. 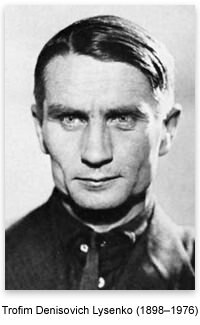 Maybe Lysenko was reincarnated as a climate scientist. Not to say I’m a Keynesian or a Krugman supporter but I’d think it would be intellectually honest, if one is making such accusations, to provide some evidence that Keynes/Krugman are wrong. After all, Lafferianism didn’t prove out very well. Just because a particular set of government officials likes what some economist/physicist/climate scientist/etc. has to say, one can’t conclude that the officials and scientists are wrong, the anecdotal evidence provided by Lysenko notwithstanding. Bob, if you mean by “Lafferianism” the supply side principle of setting a tax rate at the optimal level, then it did prove out very well. Lowering of marginal rates in 1983 prompted significant growth in the US economy. That the government then ramped up its spending even beyond its increased revenues is not a failure of the Law of Diminishing Returns. LL: If I understand you correctly, you would claim that if we were to cut the tails off mice in every generation, eventually mice would be born without tails. TL: Yes, that’s just it. LL: Then can you explain why virgins are still being born? Landau was imprisoned for a while in the late 1930s (though not because of the above, AFAIK), but Stalin never otherwise touched him. Stalin instructed the NKVD (or whichever organ) to find out whether Landau actually was a great physicist or that was just some hype. They reported back that he actually was great.